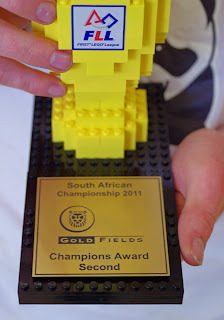 Towards the end of 2011 my three nephews competed in the South African finals of the FIRST LEGO League (FLL). I haven't yet exercised my bragging rights as their uncle, so here goes. 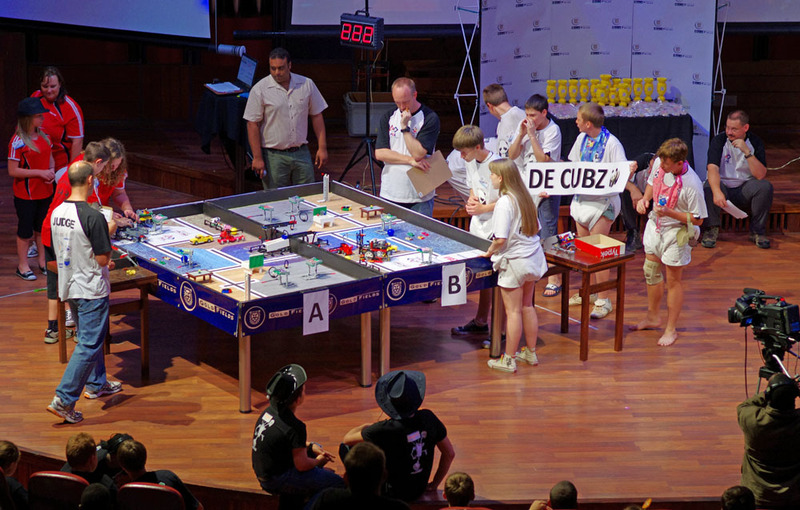 The FLL competition consists of several aspects, but the highlight is arguably the final phase where a robot constructed from Lego blocks have to complete a few tasks on a themed track. In 2010, for example, the theme was Body Forward, and the track included tasks to assemble parts of a body, emulate certain body movements, and so on. Given that 2010 was the year of the Soccer World Cup it was particularly apt to get a model of a human leg to kick a tiny soccer ball onto goal posts on the track. 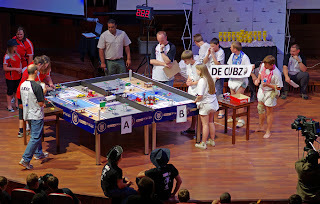 Research about the theme (outside the world of robotics) and a presentation on their findings is just one other facet of the competition the teams have to complete. But, in 2010, disaster struck my nephews' team when the robot forgot its program and wandered aimlessly across the track. (It happens when a robot with volatile memory loses power for a moment...) So, let's not blog further about the 2010 competition. In 2011 the competition was a different story! This time armed with robots with non-volatile memory my nephews were members of two different teams that tackled the theme Food Factor. 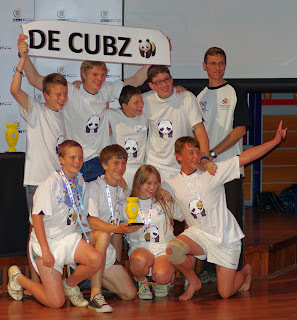 The 'older' team (from 2010) called themselves De Bearz. The 'younger' team therefore decided they had to be 'cubs', but never agreed on spelling. 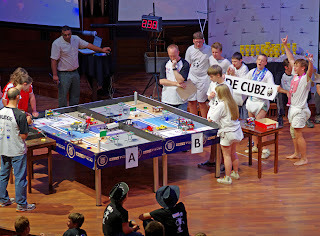 So, the team's kit used every combination of De/Da and Cubs/Cubz (with and without spaces between the two words) somewhere. Much of the competition takes place outside public view where the teams, for example, have to present their research to the judges. 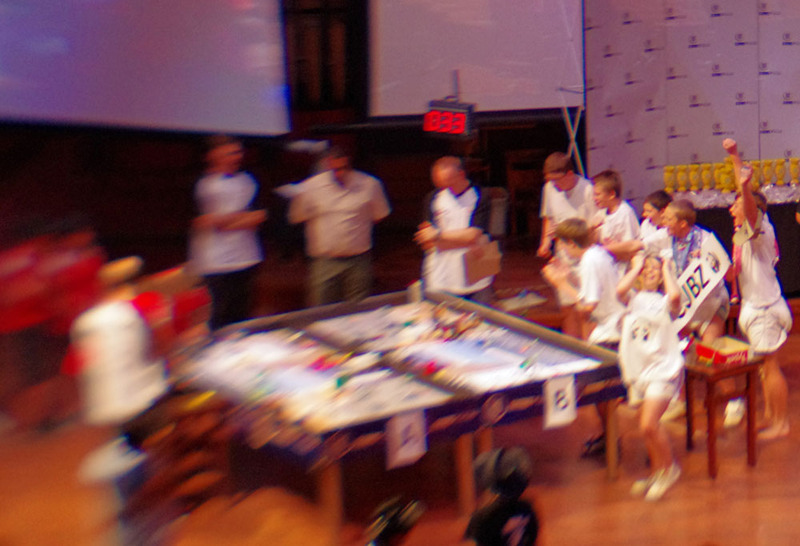 The robot runs are open to the public and take the form of a typical sporting event. The robots' actions are displayed on huge screens so that spectators can clearly follow the runs. Two members of a team are allowed to touch the robot (under certain conditions) while it is completing the track; the rest of the team act as cheer leaders trying to cheer their team (or their robot?) to victory. And the run starts! Eight seconds into the run some members cannot bear looking. (Pardon the pun...) Others seem to be rather concerned. And a few are just focused on the task at hand. 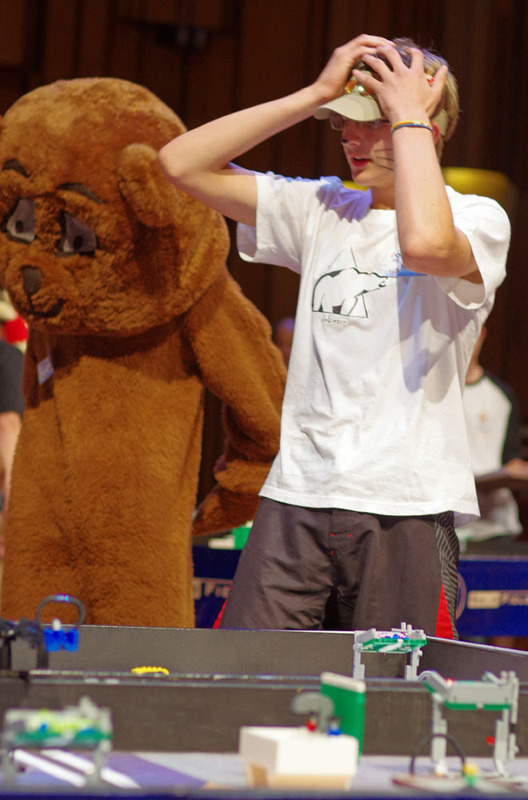 In the next picture the other team, De Bearz, are setting up their robot while a judge is looking on. My nephew, Francois (centre), is exercising his divine right to touch the robot. And they seem to be off to a good start! But sometimes robots do odd things. Even the team's mascot looks sad. Long story short: De Bearz' robot did not loose its mind again and performed quite well. They have much to be proud of. And the newcomers, De Cubz? They shot past their senior fellows and finished second in the competition! My nephew who has remained invisible thus far is Karel - the fifth person from the left in the row at the back in the picture above. He was team mentor for De Cubz. Let's hold thumbs for De Cubz in Germany. May they make South Africa proud!